Are you looking for a no-fail way to recreate the thoroughly satisfying feel of melted cheese and crispy bread without shifting into full-on pizza mode? Look no further, because we got you covered. There is no need to shell out serious money for a dubious pizza stone or get a ticket to Napoli, thanks to grilled cheese sandwiches, or poor man’s pizza as I like to call it. But don’t let yourself be fooled. Depending on the ingredients you chose, it can easily out-luxe every so-called gourmet pizza. 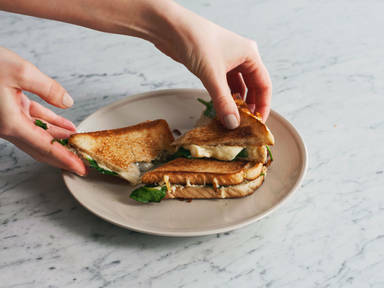 To get your grilled cheese party started, here’s a basic recipe, which is as versatile as it is tasty. You can beef it up to your liking. Just add some more or swap the ingredients to make it truly yours.